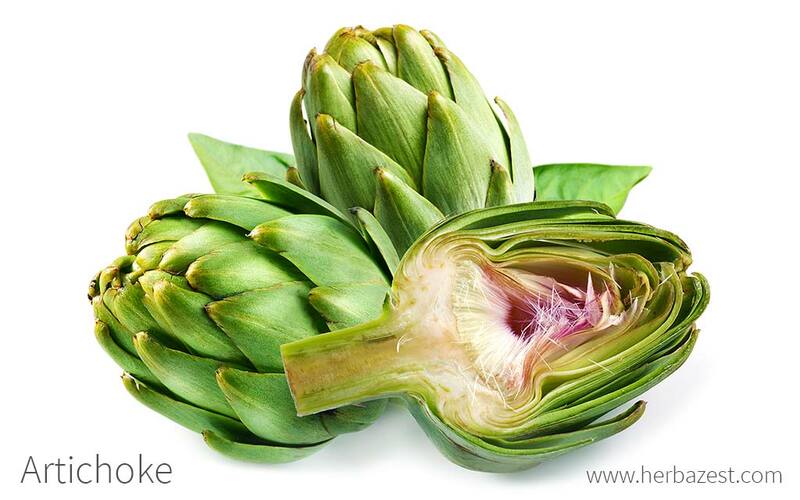 Artichoke is a tasty vegetable that helps to lower high blood pressure and reduce the risk of liver disease. Find out more about its many benefits. Originally from Europe, artichoke was domesticated over 1,200 years ago in the Mediterranean region. It has long been recognized for its nutritious value and low calorie count. Temperate regions are its natural habitat, but it is now grown and enjoyed in countries throughout the world. Aiding digestion. 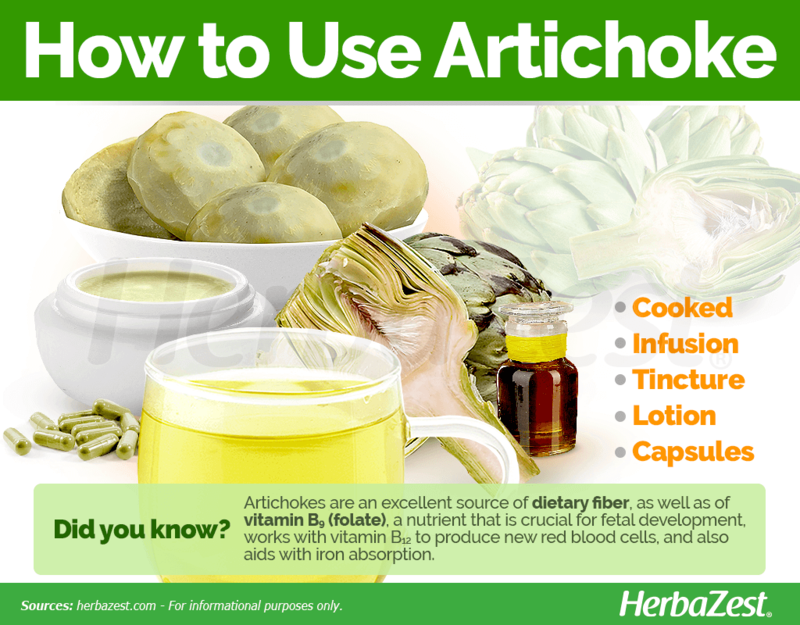 Artichokes help stimulate bile production, which is crucial for digestion and stool formation. By improving digestion, artichokes also help relieve and prevent bloating, nausea, and constipation. Preventing gallstones. 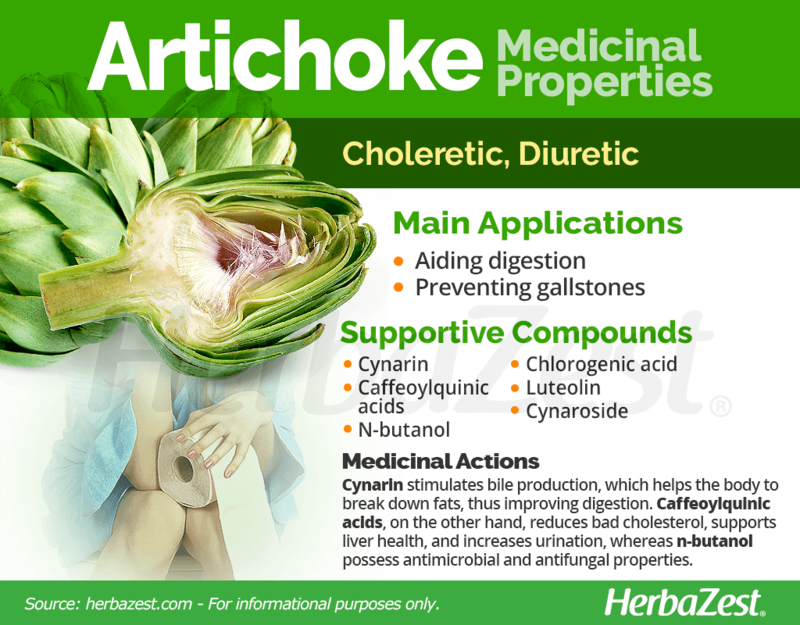 Increased bile production means that potential gallstones -which are often made up of collected cholesterol - can be avoided or broken down, and eliminated through the urine thanks to artichoke's diuretic effect. Additionally, preliminary evidence suggests that artichokes may be useful for lowering cholesterol, as well as for fighting bacteria and fungus. Artichoke is a great source of phenolic compounds that are highly beneficial. It contains a biologically-active constituent known as cynarin, which stimulates the production of bile. The human body requires bile to break down fats; therefore, the choleretic action of this compound plays an important role in the digestion process. Artichoke leaves are rich in caffeoylquinic acids, substances with antioxidant, antibacterial, and antihistaminic properties that have also shown hypocholesterolemic, liver-stimulating, and diuretic effects. The leaves of artichoke also contain n-butanol, which has been shown to have significant antimicrobial activity against bacteria, yeasts, and molds. Other artichoke compounds - namely chlorogenic acid, luteolin, and cynaroside - have shown a remarkable antioxidative effect, with chlorogenic acid being the strongest. Other herbs with diuretic properties are celery and parsley, while stonebreaker and cascara sagrada are also great for preventing gallstones. Artichoke is considered safe in health supplements and for general consumption. However, there have been some reported cases of allergic reactions when topical preparations have been applied, so those with sensitive skin should use artichoke supplements with caution. Artichoke should be eaten as part of a varied diet, and advice should be sought from a health professional before undertaking a regimen that includes the regular consumption of this herb. Because it encourages bile production, artichoke can adversely enhance the chances of a gallbladder attack. This occurs when there is a blockage in a duct inside the gallbladder, which obstructs the passage of bile and can be more likely to happen in people who have high cholesterol. It is important to discuss the consumption of artichoke on a regular basis with a doctor, particularly in the case of women who are pregnant or breastfeeding. Artichokes are an excellent source of vitamin B9 (folate), which plays an important role in fetal development, works with vitamin B12 to produce new red blood cells, and also aids with iron absorption. All edible parts of the artichokes also provide good amounts of copper, magnesium, manganese, vitamin C (ascorbic acid) and vitamin K (phylloquinone), all of which are necessary to promote a strong immune system, healthy bones and muscles, and proper coagulation. 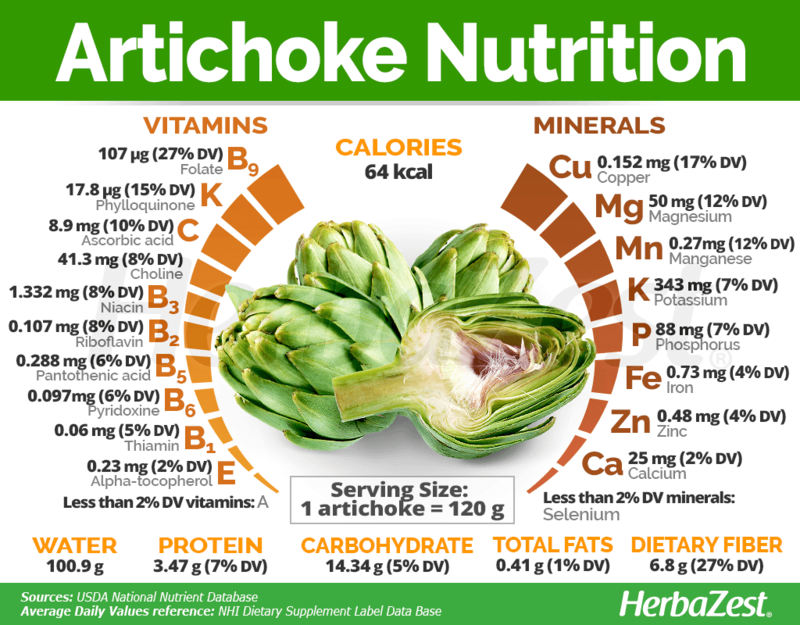 Other nutrients, present in adequate amounts in artichokes, are B complex vitamins, including B1 (thiamin), B2 (riboflavin), B3 (niacin), B5 (panthotenic acid), and B6 (pyridoxin); all of them play an important role in the conversion of carbohydrates and fats into glucose, which is used by the body to produce energy. Choline, on the other hand, is also present in fair amounts in artichokes. This essential nutrient is needed to preserve the structural integrity of the cells, as well as for producing acetylcholine, an important neurotransmitter for memory, mood, muscle control, and other brain and nervous system functions. Artichoke's nutritional value is rounded by the presence of phosphorus and potassium, two minerals that are crucial for the formation of bones and teeth, as well as for cellular regeneration and blood pressure regulation. Furthermore, artichokes possess a high amount of dietary fiber, which can help prevent and reduce the risk of many health conditions, such as constipation, hypertension, and diabetes. A medium sized artichoke (120 g) provides 64 calories and 27% of the daily value for dietary fiber. Artichokes are valued for their pleasant, slightly bitter taste. They are cooked in many dishes, or they can also be eaten raw as a healthy alternative to fatty snacks. It is also possible to purchase artichoke in the form of tea or other health supplements. These preparations are often favored by those who seek to use artichoke to treat specific conditions. Artichokes are highly regarded by chefs around the world, and they are enjoyed in many different cultures as an accompaniment to roasted meats, lasagna, stir fries, and more. Cooked. They are prized for their strong flavor and crunchy texture, as well as for their nutritional benefits. Artichokes can be eaten cooked, or marinated in olive oil, the latter being a common way of preserving them for a prolonged amount of time. Infusion. The whole artichoke head or the leaves can be brewed into a warn infusion. This way of consumption is popular for promoting good digestion and liver health, as well as for treating gallstones. Tincture. This is a concentrated form of the herb. The components of the plant are crushed and added to alcohol, which acts as a solvent. This preparation should be diluted with water before consumption. Lotion. It is possible to purchase lotion made from extract of artichoke. This is said to be a reasonable anti-wrinkle treatment; however, there is no scientific evidence to suggest this. Capsules. Artichoke capsules can be a suitable form for ingesting artichoke to soothe stomach complaints. They are thought to be able to treat these issues relatively quickly because the components can reach the affected area efficiently. The most common way to purchase artichokes is in their fresh, raw form, as a closed head. It is also possible to buy the vegetable canned or frozen if preferred. Globe artichokes are easier to locate, but lesser-known varieties can sometimes be found at specialized stores. Artichoke tea is fairly simple to make at home; however, it can also be bought online or at specialized health stores. 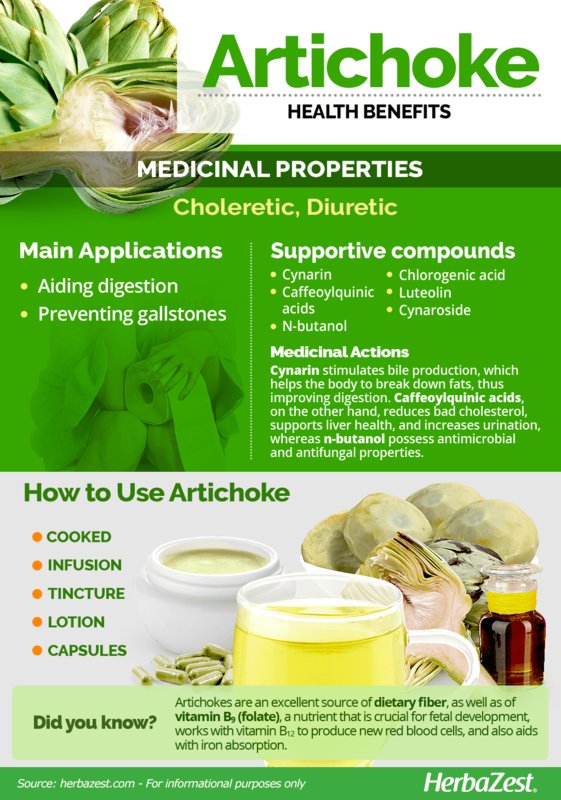 Artichoke supplements are widely available through online retailers and can also be purchased at some specialized health stores. Each brand of artichoke supplement may come in different concentrations and forms, but capsules containing artichoke leaf extract are very popular. Artichokes grow best in warm, temperate climates, but they are cultivated around the world in both natural and artificial environments. Artichoke is a fairly hardy plant, but it requires some attention and adequate conditions. Artichokes prefer well-drained and fertile ground; however, they can be grown in a wide range of soils, even the ones with some levels of salt. A soil with a pH level of 6.1 - 6.5 is the best for artichokes. They are propagated by seeds, which should be allowed to germinate indoors. The deep roots of artichoke need regular irrigation while the plant is growing and producing fruit. An ideal range of temperature for growing artichokes is 35 - 80°F (2 - 27°C). They grow well in USDA hardiness zones 10 - 12. Artichokes are susceptible to some diseases, such as powdery mildew, and leaf spot. Additionally, they can be affected by some pests, most commonly slugs, snails, and aphids. More detailed information about growing artichoke can be found in the herb garden section. The popular Globe artichoke is scientifically known as Cynara scolymus. It is a perennial plant that belongs to the Asteraceae family. The plant is made up of thick stems that have large jagged leaves and then a bud that grows to a flower on the top. The flowers grow to around three to six inches (8 - 15 cm) in diameter and consist of layers of thick leaves or scales and eventually a mass of thin purple petals on the top. The base and lower leaves of the developed bud are collectively known as the heart or choke, and this is generally the part used for consumption. Artichoke's family - Asteraceae - contains over 23,000 species spread over 1,620 genera. This group is also commonly known as the daisy, aster, or sunflower family, and includes herbs such as chamomile (Matricaria chamomilla), chicory (Cichorium intybus), dandelion (Taraxacum officinale), marigold (Tagetes erecta), and stevia (Stevia rebaudiana). There are five main varieties of artichoke that occur naturally and are commonly cultivated for food products: medium green, big green, medium purple, big purple, and spined. Artichoke cultivars - such as 'Green Symphony', 'Purple Tempo', 'Opal', and 'Concerto' - are the result of a long process of hybridization and are propagated by seeds that can be grown annually and produce a limited yield. A new cultivar, 'Northern Star', has been produced to thrive in the cold winters of more northern regions. Artichoke's importance in history begins in ancient Greek and Roman times. Artichoke's leaves, flower heads, and seeds were commonly eaten during this period. Artichokes were grown in Naples from the 9th century CE, and cultivation further spread from there to Muslim Spain and Maghreb. Italy and France began producing artichokes in the 15th and 16th centuries, and the Dutch introduced them to England during the Tudor period. They were finally brought to the Americas by the French in the 19th century. Artichoke is economically important for culinary, medicinal, and ornamental reasons. In 2005, the total production of artichoke worldwide was around 1.2 million tons. Most of this was produced in the Mediterranean regions of Europe. Italy is the biggest provider, producing nearly half a million metric tons annually, followed by Egypt and Spain, while the U.S. is the ninth global producer. The state of California provides almost 100% of North America's artichoke, with 75% coming from Castroville, in Monterey County. As the primary producer in California, Castroville has a proud and interesting history regarding artichoke cultivation. In 1959, this city held the first annual Castroville Artichoke Festival. This event has become a family-fun day with food and wine stalls, as well as various games. In 1961, the Artichoke Queen competition was initiated, a title that was first awarded to Marilyn Monroe when she visited the town in 1948. Gardening. Because artichokes are considered attractive with their strong, tall stems and showy purple flowers, they are also commonly used as ornamental plants. Sweetener. Artichokes have a property that can trick taste buds into thinking they are receiving something sweet. For this reason, the plant has been used in the manufacture of some sweeteners, and it has also been added to desserts such as ice cream. Liquor. Artichoke is one of the main flavoring ingredients in Cynar, an Italian liquor. Artichoke's interesting taste and texture make it a popular vegetable to cook with. The fact that it also boasts a range of medicinal properties has been translated into a variety of ways to consume this plant. This means that it is easy for everybody to find a suitable form to ingest artichoke and take advantage of the many benefits it has to offer.